It’s been a good week in St. Thomas for happy endings to harrowing animal tales. First was a stranded Canada Goose in a city park. Kathi Baslaugh fed the apparently injured goose she named Sweetie for several weeks. When I first read about it in the Times-Journal (no longer online), I realized I had seen her and Sweetie when at Waterworks Park with the dogs one day. I had wondered why a goose was just sitting there, not moving. But I was concerned with keeping the dogs from investigating the matter for themselves. I saw a woman head to the goose with a container of food. The cold weather make Kathi realize something had to be done or Sweetie was a goner. So she put out an appeal for help and many people responded. They rounded up the goose and took him to Beaver Creek Animal Hospital where it was discovered he had arthritis in one wing. Who knew geese got arthritis! From there, he went to the Jack Miner Bird Sanctuary in Kingsville Ontario where he’ll live safely with lots of bird friends. 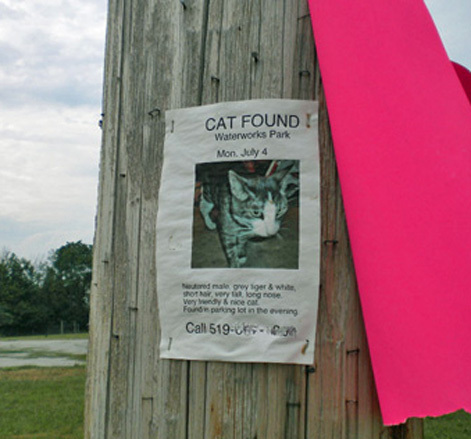 Then appeared in the paper a photograph of an orange and white cat atop a hydro pole. He couldn’t get down and had been up there for four days. 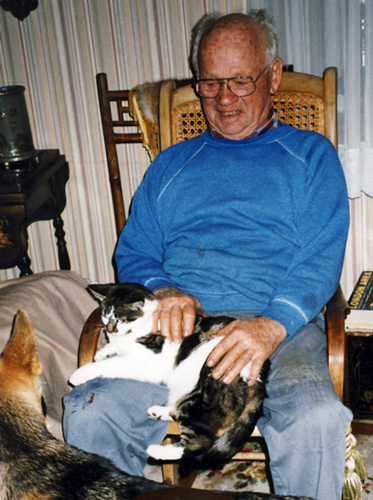 A neighbour named Bob Walker, a Korean War veteran, took on the mission – Saving Private Kitty. 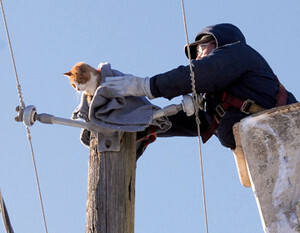 He paid over $400 to the power company to shut off the lines and booked a crane and operator. He would have paid for that too, but the people at Yarmouth Crane declined to accept payment for their services. 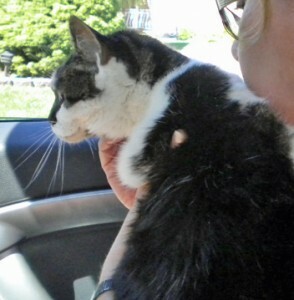 The cat, newly named Sky or perhaps Bob’s Pest, also went to Beaver Creek Animal Hospital where he’s recovering just fine from his ordeal. Other people in town and elsewhere have been calling for contributions to offset the Walkers’ expenditure. But Mr. and Mrs. Walker say they’ve got it covered and if anyone wants to donate, give it to the Salvation Army for the good work that group does at Christmas and year around. It’s so nice to hear about individuals like these who saw a problem and decided to solve it, as well as all the others who rallied to help them. Included in those others are the staff of the Times-Journal who decided that stories about a cat up a pole and a wild goose were worth reporting and following up on in subsequent days. Thanks to all. Indeed it warms the cockles. 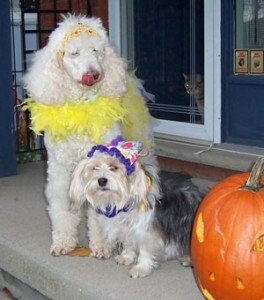 First posted on my St. Thomas Dog Blog, 3 Nov. 2010. Filmmaker Patrick Reed was on CBC Radio’s Q, talking about his new film, Pet Pharm. (It is no longer online, but Hye’s Musings has a good post about the film.) It is about the booming business in pharmaceuticals – for pets. 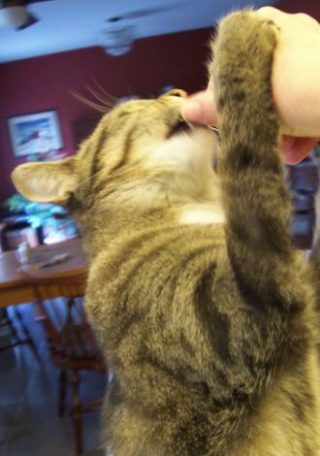 Drugs are possibly a big part of the $47 billion that Americans will spend on their pets in the next year (that figure comes from a trivia question on freekibble.com). Maybe it is money that would be better spent on starving children in the world, as Patrick Reid obliquely suggests. And maybe that’s a comparison that is really beside the point. Maybe the money spent each year on psychoactive drugs, big screen tvs, Xboxes, running shoes and high-end jeans for North American adults and children would also be better used feeding and healing malnourished children. 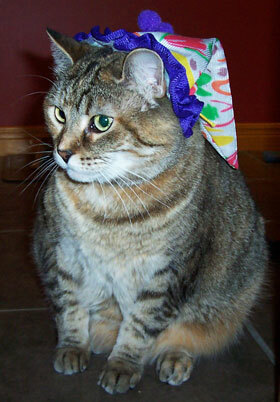 I have had a bit of experience with psychoactive drugs for cats lately. One cat has been picked on by another ever since she was a tiny kitten. 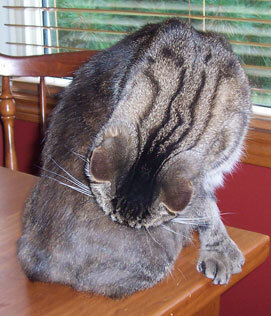 As a result, she developed obsessive-compulsive licking to the point of open, bleeding wounds. 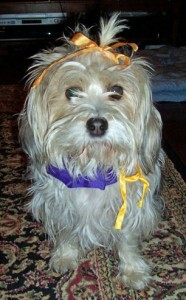 Her veterinarian thought at first it was mites or allergies so she had some tests and strict diet control. We tried a drug for allergies that worked a bit. Then more open sores. I became convinced it was stress, maybe compounded by skin sensitivity. We then tried a dog and cat “tricyclic antidepressant” called Clomicalm. It worked for a while. Made her very sleepy, but when she was sleeping she couldn’t lick herself. Then the calming effect of it started to wear off. She needed more and more of it. There’s only so much you can safely give. I saw no cure short of a change of home for one or other of them. But that didn’t seem a likely option. Finding a home for any adult cat is difficult. But a ten year old not awfully pleasant one? Or a formerly feral cat scared of anyone except us? Euthanasia for one or other of them? I considered it. Life for the young one was not good, but another home likely wouldn’t be an improvement for her. The old one had less life ahead of her, but did she deserve to die because she doesn’t like other cats? No. But the stress of one cat licking herself raw and the other hissing, spitting and attacking was making me want to stress-lick or tranquilize myself. In desperation, I called my vet. “Give me drugs – the strongest you’ve got. Some for me while you’re at it. I don’t care if we’re all comatose as long as this stops.” “Well, there is something new we’ve got,” she said. “It’s called Feliway and it’s like a room air-freshener.” “I’m on my way.” She said it’s essentially the pheromone that cats exude when they’re happy, put in a bottle. There’s also a dog version, D.A.P., advertised in Pets Magazine, a good Canadian magazine you can get free at vet clinics. 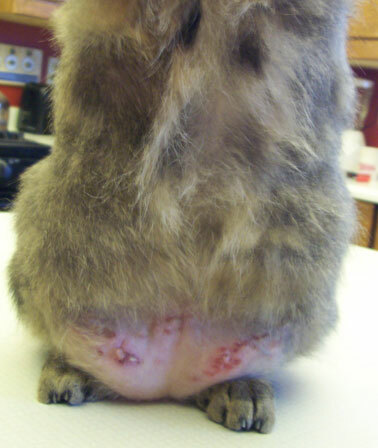 When the little cat went for her shots this year, the vet was distressed to see the raw welts on her belly. She’d forgotten how bad she looked before. I told her I wasn’t worried because her belly and her attitude were so much better than before. Both the cat and I could live with some sores. She probably will have them for as long as the old cat is alive. 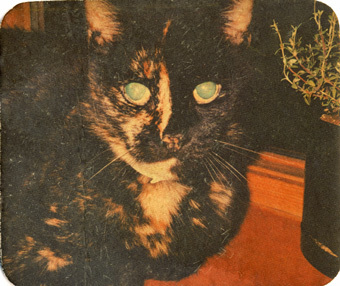 And knowing that cat, I imagine it will be a good few years more. So do I think giving psychoactive drugs to pets is bad, wasteful or the lazy way out of behavioural problems? No, not if that is the only solution aside from euthanasia and if a better home for the animal isn’t a viable option. It shouldn’t be the first method tried and it shouldn’t be seen as “normal”, any more than having every kid hopped up on Ritalin should be seen as a normal response to over-exuberance. From St. Thomas Dog Blog, Sept. 4, 2013. Reposted in honour of US Memorial Day and Harold Palmquist, a US veteran who is biking across the country with his dog to raise money for homeless vets and their pets. Please God, I have never had to beg on the street and I’ve never been homeless. I don’t know how I’d look after myself, let alone a dog or cat. 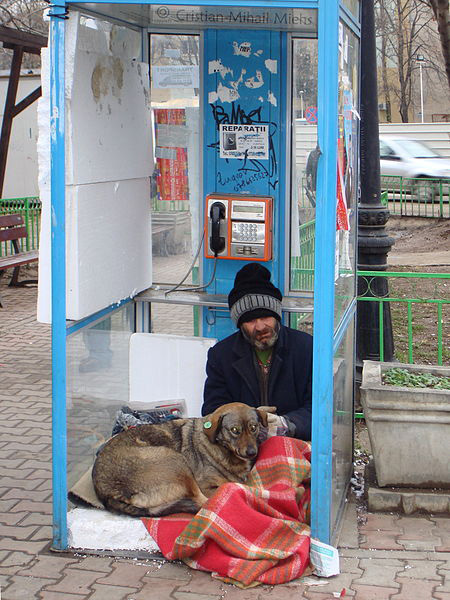 But people do; they survive on the streets of even the coldest cities, and many do so with a pet. I have had to carefully parcel out funds so that rent was paid and my cat and I had something to eat. A student promotion credit card was our lifesaver, if a month’s supply of money ran out before the days did. The cat and I ate some odd meals – whatever I could find in the limited food section of Woolworth’s. Grocery stores did not accept credit cards then. Fortunately for us, those times were not frequent. For some people and their animals, it’s a more regular occurrence. Today, on CBC Radio’s The Current (sorry, story no longer available), the stories of some people perhaps marginalized by society but not by their companion animals. James Bowen, whose cat helped him out as a busker and now as an author. 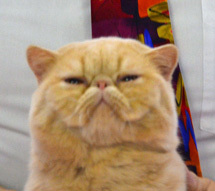 As he said, thanks to Bob the cat, he now pays income tax. 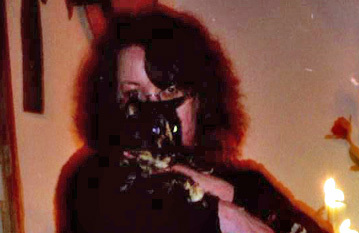 A woman whose cat keeps her off crack. A woman in Edmonton who started a pet food bank, with donation bins in pet stores and a system for getting the food to those who need it. And a University of Colorado sociologist who has talked to homeless pet owners and written a book called My Dog Always Eats First. That book’s author, Dr. Leslie Irvine, talks about homelessness being a “master status” in our society. That means that it overrides all other statuses that a person holds. Those may be “ascribed” such as gender or ethnicity or “achieved” such as profession or educational level. Whether a holder of an advanced degree or a high school dropout, a person sleeping in a doorway is seen only as ‘homeless person’. And you’re not likely to even think to ask what else a panhandler is as you drop your change in his or her cup. But there is another master status, I think, that people ascribe to themselves: that of “pet owner”. As one, I will go over and talk to a “homeless person” if he or she is accompanied by pet. I see the animal and want to make contact with him or her, and therefore the person as well. This is not to suggest that homeless people should get pets in order to improve their chances on the street. Accommodating people and their service or pet animals has caused real problems for many shelters trying to be inclusive. Dog fights, fleas, provision for people with allergies and abandonment of animals in the shelter are some that I remember from a radio documentary I heard a few years ago (sorry, can’t find a link). But for many of us, homeless and homed, our pets are solace and friendship, providing someone else for us to think about and care for. And every dog, cat or guinea pig living happily with their person on the street is one less unwanted animal needing rescue or dying from neglect. 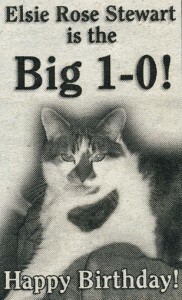 This day, in 1997, I laid my cat and dog in their final resting place. 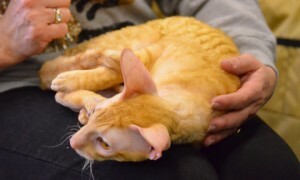 Cedric, the cat, had cancer of the jaw. 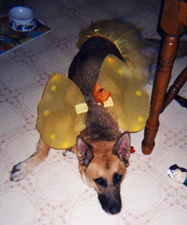 Jamie, the dog, had arthritis so bad he could barely walk. 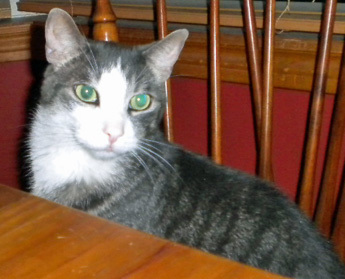 Cedric had been with me for fifteen years and Jamie for ten. There was nothing more that could be done for them. I knew I couldn’t go through it twice so decided they’d go together. My vet – and friend – came to my house and did it quickly. I felt like it was Dr. Mengele walking in the door when he arrived with his little bag of needles. It wasn’t painless for me. Afterwards, four of us carried them to their grave. The vet, me and two friends. Cedric was wrapped in a towel and Jamie was in his bed. Four of us cried, one gave a eulogy, then we filled in the grave. Next day, we made a perennial bed on the top of their grave. Tiger lilies for Cedric, a tortoiseshell, and orange and yellow dahlias for Jamie. The lilies were mottled in colour and sleek, like Cedric. The dahlias looked happy, like Jamie. Cedric came to me soon after my boyfriend dumped me. He hadn’t wanted a cat or dog. I had. So the first thing I did when I got my own place was put out the word that I was cat-hunting. Friends had a very pregnant cat they had found in the woods. Their own cat terrorized her and they feared what would happen when the kittens were born. I took her. I feared she was going to give birth on the drive home. But it was a week before the kittens came. I was much more nervous than she was, and she was pretty nervous. I had my landlady come help because she was a registered nurse. Ceddie and I had a good life in many homes. 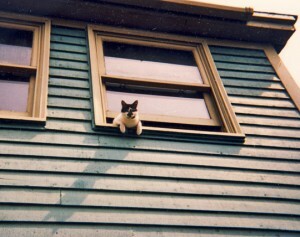 Jamie joined us when he decided he preferred our house to his own. He lived nearby, at the end of a long country lane. A very social dog, he preferred life in the village. 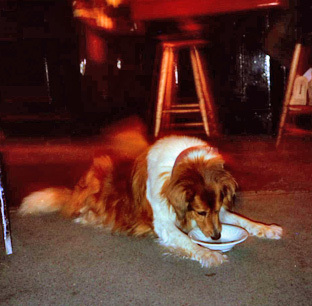 Jamie was a self-sufficient dog. Didn’t have a lot of dog friends but a wide circle of people friends. He’d do his visiting rounds every few days. When he got older, if he was too tired to walk home, someone would drive him or phone me to come get him. He made friends with a couple neighbour dogs. They’d come visit him or he’d go to their place. He walked along beside you, but I don’t think anyone ever trained him. He’d run in the woods after rabbits. Never caught one, and never lost track of you. Neither Cedric nor Jamie were ever my ‘fur-babies’. They were my friends and, especially Cedric, my advisors. 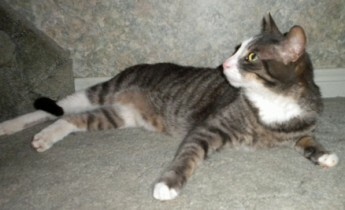 Less than a month after they died, a young stray tabby and white cat turned up at my house. I wasn’t ready for a new cat, but no one claimed her. Elsie moved in and is still with me. 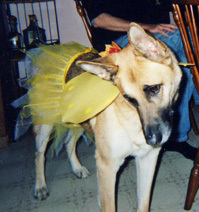 After a year, a German Shepherd pup needed a home. So Jack joined Elsie and me. 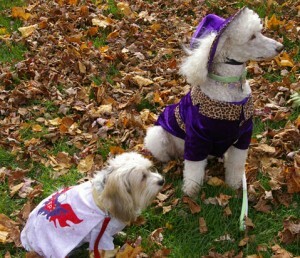 First posted on my St. Thomas Dog Blog on April 13, 2011. Now, twenty years later, Elsie and Jack are also gone. A while ago, I met a man, his son and their two dogs. I was making a fuss over the dogs, and the boy said “she’s going to have babies”. The dad confirmed it. She was purebred, he said, as was the father of the pups. So I figured daddy dog wasn’t their other dog, an unneutered male, but not the same breed. Both dogs were about 2 years old, and after the puppies were born, the man said, they’d have both dogs neutered. But they wanted her to have one litter of puppies – for her sake, for the kids to see. I didn’t say much about it, other than asking if they were breeders. “Oh no, just she’s a good dog and we know people who’d like one of her pups.” I agreed that neutering them was certainly a good idea. They seemed like nice people. They had got the female from a breeder they know who enters his dogs in field trials (she was a hound). This guy wants to hunt with her. 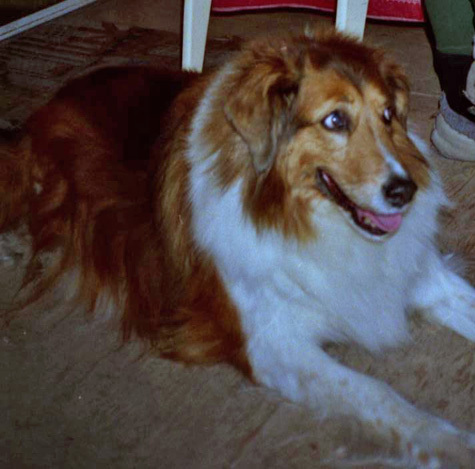 She clearly was a beloved pet, both dogs were. Her people knew and appreciated her lineage even though they weren’t into dog showing or competitions. Probably those pups will get good homes. But what I wanted to say – scream even – was why? why? why? You’re not breeding her at the request of her breeder, so that her pups can add to the prestige of his kennel. You’re not, fortunately, breeding her so you can make some extra money off selling them on Kijiji. You are doing it so she has the experience of having puppies and so your children can watch the miracle of birth. Nice, family-oriented ideals – but why? Why, at age 2 with no breeding plans in his future, was the male not already neutered? Why do people think it’s necessary for a dog’s fulfillment to have puppies? And why is deliberately letting a dog (or cat) get pregnant the only way to let your children witness the giving of birth? A dog adjusts very quickly to being neutered. At least, it’s quick if he’s young. When older, when used to being “Mr. Testosterone”, the adjustment can be harder. Still, the adjustment he has to undergo is preferable to the fights he’ll get in, the roaming he’ll feel compelled to do, and the unwanted puppies he’ll create given half a chance if he is not neutered. A female dog does not feel she’s missing out on something if she never has puppies. There is no health benefit for her in having puppies. If it’s important to you that your children witness birth and the first weeks of animals’ lives, there are other ways of doing it. There are always irresponsible people who let their dogs or cats get pregnant, then don’t want to be bothered with them. Those pregnant animals end up in shelters or wandering the streets until they get picked up by the dog catcher. In every city and town, there are animal pounds and rescue groups looking for foster homes for pregnant dogs and cats. You can take the mother in and look after her, experience the miracle of birth and help her look after the newborns. When they are old enough to leave their mother, the babies and mother will go into the foster/adoption system. You can have the joy of nurturing a mother and her babies and you have a support system finding homes for them. You’ve got what you wanted for yourself or your kids. You’ve helped animals in need, and you haven’t contributed to the problem of too many pets and not enough homes. 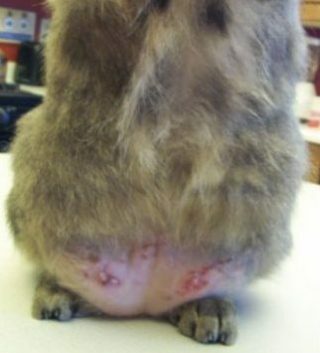 Anyone willing to foster a pregnant animal for a couple of months can witness the miracle of birth. Unfortunately, the supply of unwanted and/or unneutered pets so far seems inexhaustible, so finding a needy animal to foster isn’t likely to be a problem. 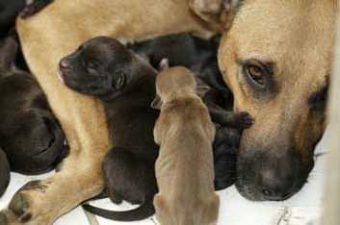 If you can foster a pregnant dog or cat, contact All Breed Canine Rescue, St. Thomas Animal Control, Animal Aide or Pets/Friends 4 Life. The miracle of birth will be just as miraculous and moving. The dog and her 12 puppies in the top photo is Kylie. An elderly feral dog, she was rescued by Stray Rescue of St. Louis in Missouri while pregnant for the umpteenth time. The middle photo is of Penny who, after weaning her own puppies, nursed a litter of abandoned pups. She, and they, were at Save a Mom Pregnant Dog Rescue in East Sparta, Ohio. The third photo, in St. Thomas ON, speaks for itself. What happens to the cats and dogs when there’s no room at the pound? His barn and house cats were well-treated. They drank milk straight from the cow, all lined up in a semi-circle, waiting, at milking time. He’d shoot milk out toward them, and they’d lap it up then lick off their faces. Being a barn cat, in a good barn, is a pretty good life. You can chase all the mice you want. You’ve got cozy places to sleep. There’s always something to do. 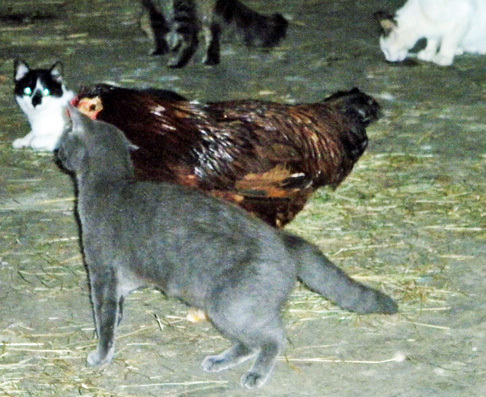 Barn cats have to learn to navigate around animals much larger than themselves. Some don’t, so there are always some losses. Most horses like cats and take care stepping around them. Cats sometimes will sleep right in a stall beside a horse or cow. It used to be that few barn cats were neutered. With a high attrition rate, due to large hooves and farm machinery, the farmer wanted to be sure he always had enough mousers. But many farmers now get their barn cats fixed. 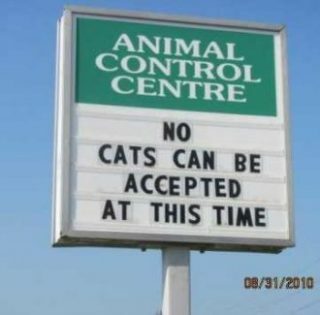 There are generally cats available if you need more. Usually more than enough. So each farm does not have to be a “cat factory,” producing its own supply of cats. The bane of most farmers are people who dump off their unwanted pets at their gates, assuming they’ll be taken in by the nice farmer. 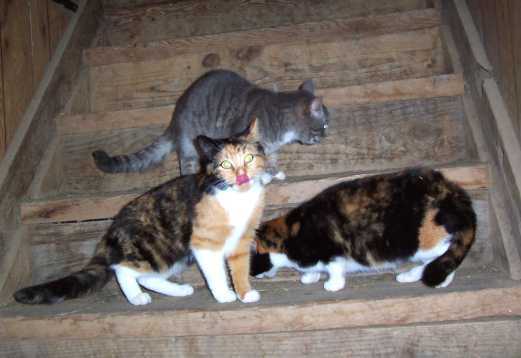 Then the “nice farmer” has to pay for the spaying and neutering of these additions or look for other homes for them. The City of St. Thomas has started seeking farm homes for some cats at the Animal Control Centre. 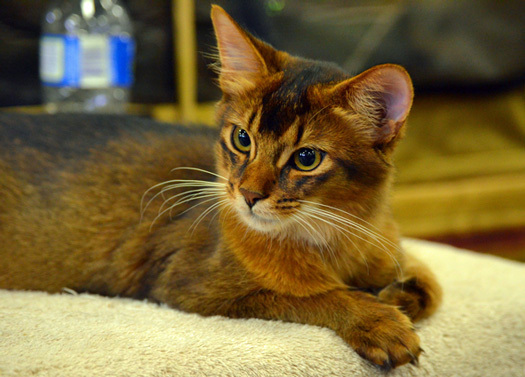 The idea is to neuter suitable cats and adopt them out as barn cats. It’s an innovative way to decrease the number in the pound without euthanasia and, especially for semi-feral cats, provide a well-matched home. 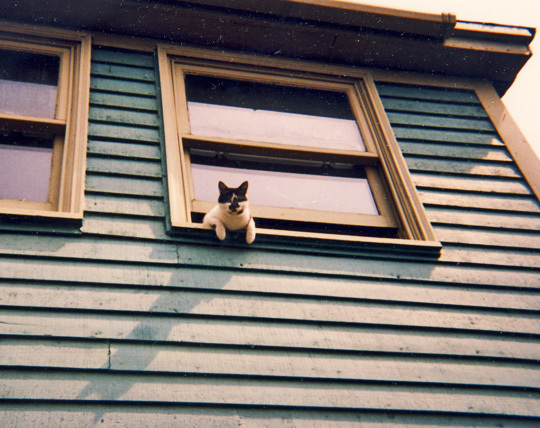 Some cats prefer a life more or less on their own; they don’t want to be housecats kept indoors. They want to mouse and explore. It’s always saddened me, seeing those ones in shelters. Looking out a window if they can get to one, or sitting sullen in the back of a cage. You know they would rather be outside living life according to their own rules. And that’s what barn cats do. He’s doing well, considering. He misses you and his own bed and routine. He spends a lot of time in the garage. It’s where he feels safest, I guess. It was where he stayed that first night with us, a place to let him adjust. At the time, I thought it would be only a day or two of strangeness for him. I thought you’d contact us as soon as you saw the ads and posters. A well-looked-after cat like him must have people missing him, I thought. A couple people did call, hoping he was their lost cat. But he wasn’t. He’s been dewormed and vaccinated. He probably already was, but we couldn’t risk it. His vet bill is $191 and he needs booster shots. Thank heavens you had him neutered. He’s a funny cat, loves to bat cat toys around. Loves catnip. He has no fear of dogs or of people he doesn’t know. He’s very well adjusted, pretty much the perfect cat. He prefers canned food. When we found him at the park, he happily chowed down the cat kibble we had with us. Then, belly full, he went “mmpff” to kibble and demanded canned food. So that’s what he gets. The vet thinks he lost a lot of weight fast. His skin is loose, as if it used to cover a larger body. And he’s terrified of the sound of rain. Those things make me think he was wandering on his own for longer than I’d thought. His name is Wally now and he answers to it. Maybe you or your kids called him Tigger or Sox for his white feet. He loves to sprawl across laps and hug up close in your arms – but I guess you already know that. So he’s ours now. Just one request: please don’t replace him with another kitten or puppy until you’re prepared to make a commitment that lasts as long as that animal’s life. I can’t take another of your pets when you don’t want them anymore. 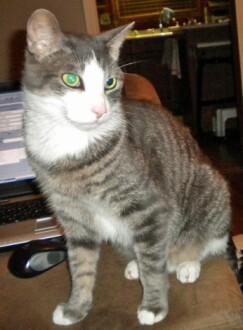 The next one I find will make a quick trip to the vet to be euthanized if I can’t find another home quickly. I won’t take him or her to the pound or shelters. Why? 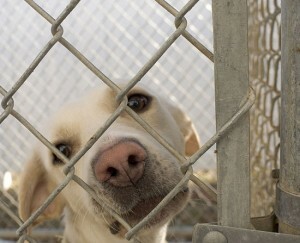 There aren’t enough homes for all the cats and kittens, dogs and puppies dumped and produced by irresponsible people. Caring for your pet in the pound costs a lot of money. City employees get good wages and benefits to scoop litter boxes and put out kibble. Rescue volunteers do it for free. But how much labour and money are they expected to give to look after pets that people like you can’t be bothered with anymore? I too do it for free. But I’ve reached my limit so, remember, the next dumped animal I find gets a one-way trip to the vet. It’s a kinder death than the starvation you consigned Wally to. 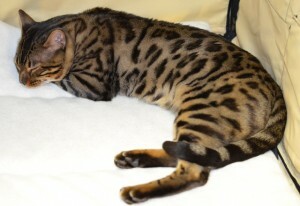 If you think he is your missing cat, please accept my apologies and contact me!